Bright, Sunny and HOT, HOT, HOT all day. Who left the sauna door open? The first race of the new season saw a dozen cars take the green flag at 10:00 A.M. Teams in the High School and Open Classes starting the year were Brandon H.S. with 2 cars, Tampa Bay Tech (TBT) with 1, Middleton H.S. Girls team (The boys couldn’t get their car back together in time) Simmons Career Center (Their first race) HCC, USF, Robinson Racing (with one car) and Rodney with Tiger Racing. In the experimental battery class was Cliff from ProEV in the 39 car and the Electrocutioners with Drew in the 72 car and Miss Electrocutioner Pony Gradert in the 8 car. Drew and Cliff battled hard in both races with Drew taking both races by one or two laps for a record total of 220 for both races. All the experimental battery cars had flawless races. In past races they have had problems making the tires last the whole race. The HCC team gets kudos for sponsoring such a excellent race and providing drinks and snacks. They did have a problem with their motor controller, their second in two days, when the magic smoke escaped from it. Seems there was a problem with a loose battery connection to the controller causing sparks and other unneeded problems. Not having another controller handy, they were done for the day shortly after the start of the race. There were other problems with loose or bad connections during the day. The gremlin bit the TBT team when one of the battery cable clamps was bad and caused battery problems during the first race causing a 5th place finish. In the second race they got it fixed and finished 1st. Middleton finished a strong second in the first race but had the connector gremlin bite them in the second race causing them to lose a lot of battery power. Simmons Career Center in their first race ever had a good outing in the first race with 80 laps before the batteries went down. The electrical gremlin caused problems for the second race. We look forward to seeing them at future races and are excited about them hosting a race in December. Brandon set a record for busted wheels and busted forks with the 9 car having one wheel go bad and then another collapsing. The 14 car had a weld break on the steering fork and had to withdraw early in the second race. Both cars had successful demonstrations of the roll cages with some paint scratches the only visible signs. We are excited to see them back on the track this year. Rodney was testing some new motors and verified that the first one was not up to the task. There was that burnt electrical wiring smell on the front straight as he went by late in the race. In the second race he used another motor and his lap count was way up without that burnt wiring smell. Hope to see Wharton, Strawberry Crest, Foundation, Middleton (boys team), Killer Watts, the 3rd Electrocutioner and the 2nd Robinson cars racing at the October 17th race. We will be making the stat sheet bigger. Check the schedule for future races. One note for the Middleton race, We will be on the 1/4 mile running track so get your drafting gear ready. The course at the HCC Brandon Campus is a familiar one. It is the first parking lot you come to, the one by the ball field. Teams will be in the infield of the track. 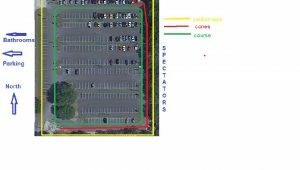 ALL others will be in the grass to the west side of the track or in the paved parking lot just to the east of the track. We are going to cut down on the numbers of vehicles and people in the pits this year. Teams should arrive early. Since this is the first race of the season we will be doing an extensive inspection of the cars and drivers. It will include drivers bailing out and brakes and steering. The track is a 1200′ plus rectangle and one of the smoothest we run on all year. Just watch out for the water hazard on the north side of the track. At the start of a new season there are a few questions floating around. Who will take Bradys place as the lead driver for TBT? Will Brandon be back as strong as they have been in the past? Who will be the lead driver for Brandon? Will the girls from Middleton be as strong as they were at the end of last year? Who will be the new driver for Foundation Academy? Will we see Strawberry Crest come back? How will Wharton do this year? Whats with the Electrocutioners getting a third car number? How will the HCC team do on their home track? Will Rodney be able to repeat? I hear he has been making modifications to his car. Will the experimental battery class get bigger this year? Bring your friends and come on out to the races. No hearing protection required. Vaughn Nicholas advised us that the date for the Five Flags Race will be either the 2nd or 3rd weekend in April. Five Flags will not set the date until their current race season is over in October. We will use the School District of Hillsborough County, Teacher and Student handbooks as a guide for our Code of Conduct for Teachers / Team Sponsors and Students. We will use the College or Universities Code of Conduct for our college teams. We will require Board members and Auxiliary Members to be professional and courteous when they are representing Electrathon of Tampa Bay and / or the School District of Hillsborough County. Parents and guests at our events will conduct themselves in a manner that does not draw negative attention to Electrathon of Tampa Bay and / or the School District of Hillsborough County. Should there be an issue at any of our meetings or events, any member of the Executive Board can be approached and informed of the concern or issue so that it can be handled immediately. We will also require each team to have a Team Sponsor and an alternate (name and title must be on file with ETO before first race of the season) in case the primary sponsor is not available to attend a race with the students. Furthermore for the safety of everyone, the sponsor and team members are the only ones allowed in the pit area during a race. Parents, guests and non-team members will leave the pit area when the call to line up (cars to start line) is announced. On September 26, 2015 we will hold our first race of the 2015-2016 season at Hillsborough Community College in Brandon Florida. Our Events Committee has worked to get the details and safety measures ready for race day. On another note, we had a change in the race schedule as Middleton High School (District Administration)changed the date of their open house. Executive Board Members, along with Board Members representing each team (Sponsor and Student for High Schools) are invited to the Board Meeting to prepare for the new season. Meeting starts at 4pm at the Cracker Barrel by Lazy Days RV in Seffner. The back room has been reserved for ETO Meeting from 330pm to 730pm. 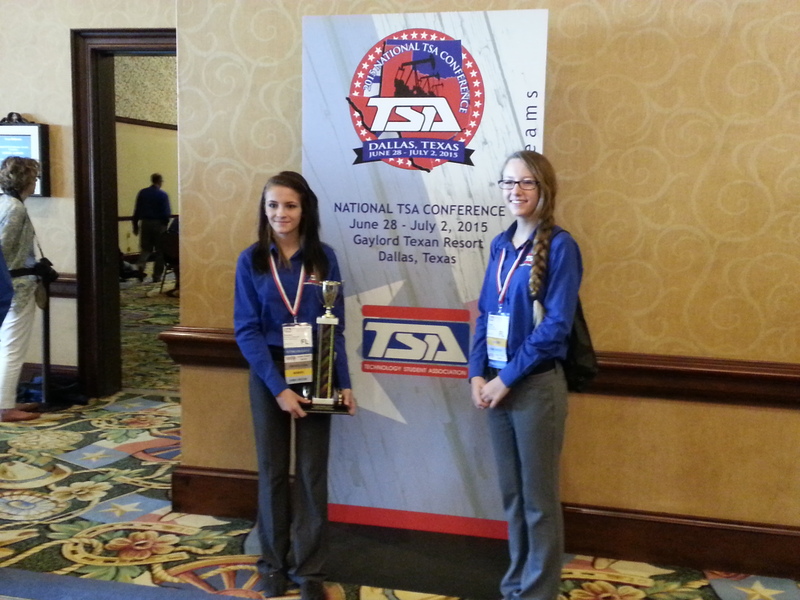 Michael Wilson reported: Our Junior Solar Sprint girls team won 1st place this summer at the Technology Student Association (TSA) National Conference in Texas. Their car ran the fastest time and the display showed the engineering process of making a solar car. Our Robotics Academy is one of 4 STEM programs that is being considered for national certification. This past school year we were awarded a model program status and will be reviewed by the national committee next spring. In February 2015, Tiger Racing celebrated its 20th year in the sport. 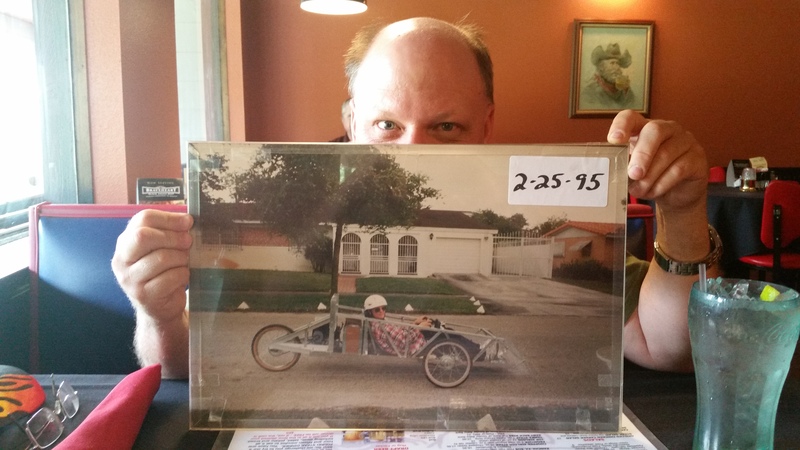 This is t he first Electrathon built by Rodney Schreck in 1995.